If you registered via a social network like Facebook Google+ or Amazon you may never have had a password or may have received a welcome email with a blank password in it. this is because you don’t need one as long as you continue to login via that social network. If you would like to, you can get a password here. I can’t reset my password! You may still be logged in with a social account or a cookie. You will not be able to reset your password unless you are logged out and the link will send you in a loop. You need to log out here first. Going in a circle? Is it asking you for your password to change it? You may still be logged in. Log out here first then you will only be asked for your email address. If you still can’t reset your password, and dont get the reset email, and it’s not in your spam folder, send me an email at info@grutbrushes.com and ask me to reset it for you manually. Hotmail users note: Hotmail routinely blocks all emails from GrutBrushes.com so if you have a hotmail address and aren’t getting any emails, and they aren’t in your junk/spam email folder then this is probably what heppened, in that case, send me an email and I will reply with my personal email. How Do I Download My Brushes? How do I install all my Art Brushes Complete brushes into Photoshop CC in one go? This only works to install the ABR files into the Brushes panel in Photoshop CC. Installing brushes without the plugin: If you are not using the GrutBrushes plugin panel, The easiest way is to drag and drop the TPL files into the Tool Presets panel or onto the top menu bar. ( Make sure you unzip/extract them to your hard drive first! ) You will see them show up in the Photoshop Tool Presets Panel. tip: If you don’t see them there, uncheck the ‘current tool only’ box (see here) at the bottom of the Tool Presets panel. Only install the TPL files. Don’t drag the PNG or PDF files into Photoshop. You can also try dragging the TPL files onto the Photoshop app icon on your desktop. You can also try double clicking on a tpl file and if Photoshop is properly configured it should install into your Tool Presets panel. Make sure you extract/unzip the files to a folder on your hard drive. Installing from an opened zip folder will not work. Try dragging the TPL files onto the Photoshop app icon. One of my customers told me a tip that worked for him in Photoshop CS. In file explorer, they selected all the TPL files and then either double clicked on them or hit enter on the keyboard and it loaded them all into Photoshop, that might work for you. Keep in mind that the Art Brushes Complete set is HUGE so it may take some time to install and computers with low RAM might have a hard time doing it all at once so you may want to unzip that one to your Hard Drive first and choose the TPLs you want to install from it a few brushes at a time. I Installed the TPL files but I don’t See Any Brushes in the brush panel. Where are they? Why TPL files? Why not ABR? TPL is compatible with all versions of Photoshop, and many other apps including the GrutBrushes plugin. To put everything out in TPL and ABR 2018 is more than double the work and with new brushes coming out every week I would be spending days every week just updating, converting, uploading and then testing all the sets constantly and would have no time to actually make anything. This video (popup) shows you how to install multiple TPLs at once in Photoshop CC so it doesn’t have to be tedious. Where Can I See What All The Brushes Look Like? You can see all the Photoshop brushes on one page here. You can move your mouse over or tap on a brush and you will see it zoomed in and up close! Can I use these in commercial work? Yes! Buying them gives you a license to sell any work you create using these brushes or Art Surfaces. You can’t re-sell the original files you downloaded but you can sell any artwork you make with them. Are these Brushes compatible with my version of Photoshop? 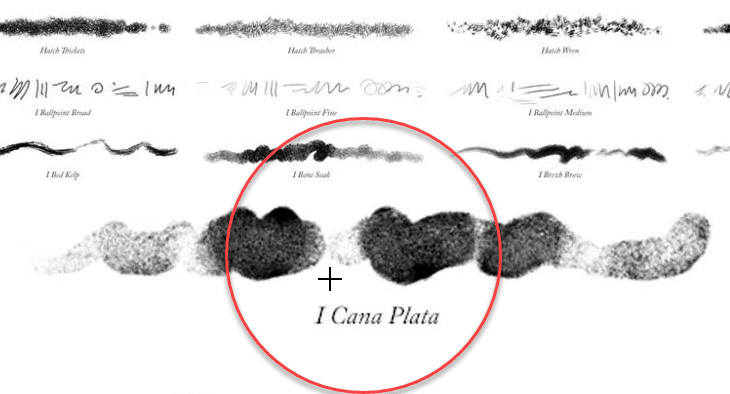 These Photoshop brush tools require CS5 or higher. To make sure they work with your version of Photoshop download this free Photoshop watercolor brush. If this one works with your version of Photoshop, they will all work. To get real use out of these brushes you will need a pressure sensitive graphics tablet (like a Wacom, Huion, Yinova, Monoprice, etc) Again, if you are in doubt as to whether these brushes work with your setup download a free brush to try before you buy. Are these Brushes compatible with Photoshop Elements? You will see many other apps and utilities say that they can use “all Photoshop brushes” or they can “load abr brushes” but 99.99% of the time what this means is that they can load the brush tip shape. And only the shape, but none of the dynamics. GrutBrushes are all about the brush dynamics, which are all the rules that control the way they behave when you move them, so the tip shape has very little to do with the way they look and will not look anything like it when you use it. Imagine freezing the bristles of a traditional paintbrush and trying to paint with it. It would be useless. It’s the way the bristles bend and move and release the paint as you as you paint with them that makes your brush strokes look the way they do, not the shape of the tip. No, you are fully paid up, the brushes are yours to keep forever and will not be charged again. Make sure you back them up! If you bought a Membership or a set that includes one, it will expire automatically at the end of your membership period. Memberships do not auto-renew or auto-rebill and they will expire unless you renew them manually. 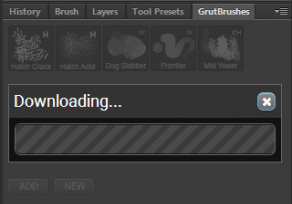 How Do I install the GrutBrushes Artist’s Toolset Panel Plugin? 1. In Photoshop’s menu, File > Scripts > Browse… select the GrutBrushes_installer.jsx file. If after installing, you don’t see the plugin under Window-> Extensions your computer may be stopping the installer from writing to your system drive. You can install the plugin manually by following the detailed instructions for both Windows and Mac here It basically involves copying two folders from the zip file onto your computer. How Do I Uninstall the GrutBrushes Plugin? Do You Have More Tutorials? I wish I had more!…but here are a few. How Many New Brushes Come Out Every Week? If I’m around I may break in to chat but you can also type ‘asknicolai’ to leave me a message.